For our five-year anniversary, Jeremy and I went camping, because camping is the actual best. 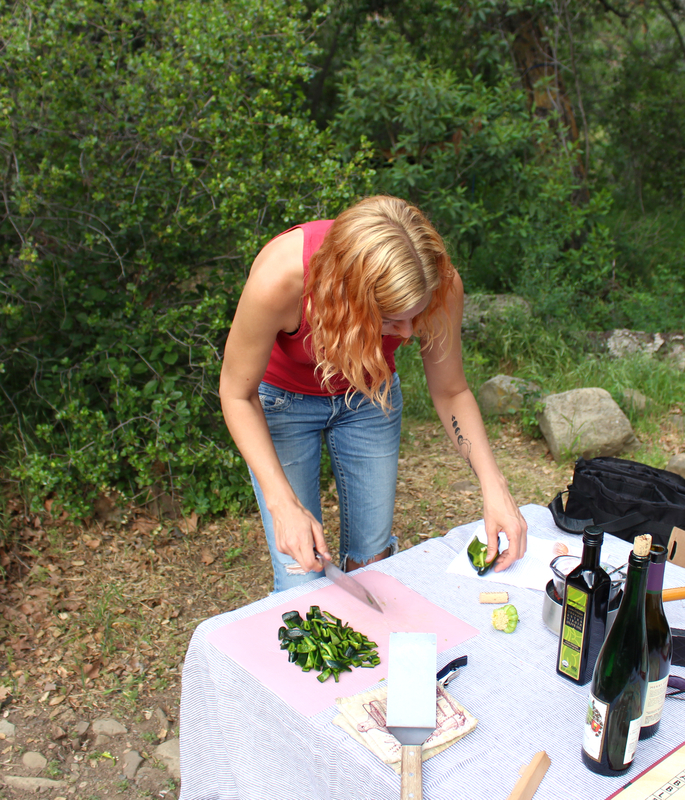 And since it was a celebration, and our first time camping just the two of us no kid, and because food and wine is one of our shared love languages, and also just for fun, we decided that we wanted to make a fancy camping meal. We always bring our big cast iron skillet when we camp, but we mostly reserve it for tofu scrambles and breakfast taters on the little Coleman stove. We’ve never cooked with the cast iron over an open flame, and neither of us had ever made paella before. So, paella seemed a natural choice, to finally try our hand at high-brow campfire food. And oh boy, it was. It really really was. 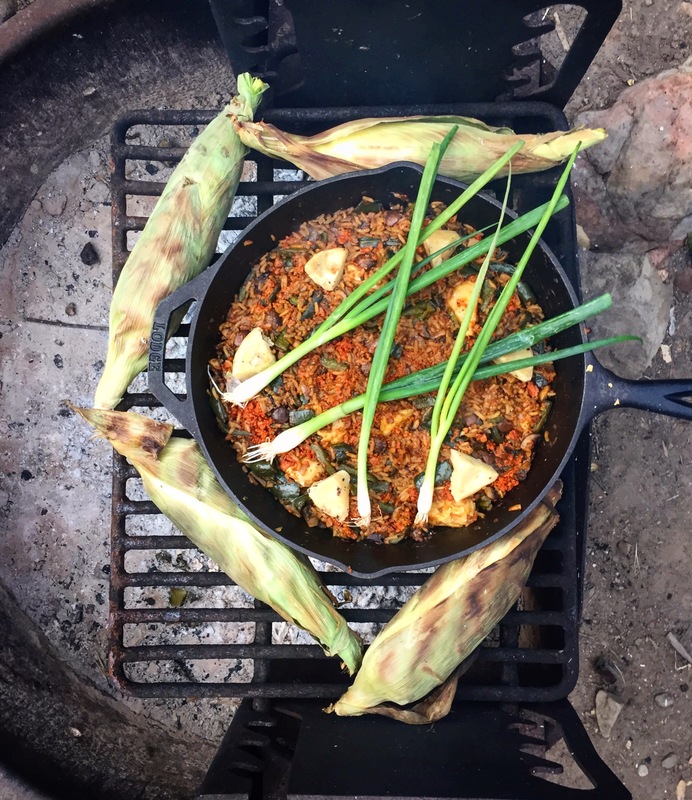 Paella is perfectly suited for campfire cooking, because it’s a one-pot meal that’s actually super easy (but feels really sophisticated). But traditional paella usually includes seafood and sausage. 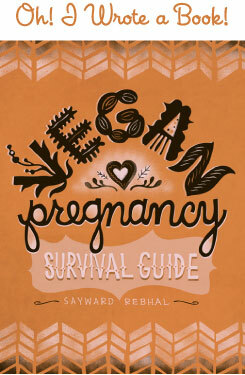 We chose mushrooms and soyrizo to make this vegan gluten-free version, and we couldn’t have been happier with the results. It was so good! 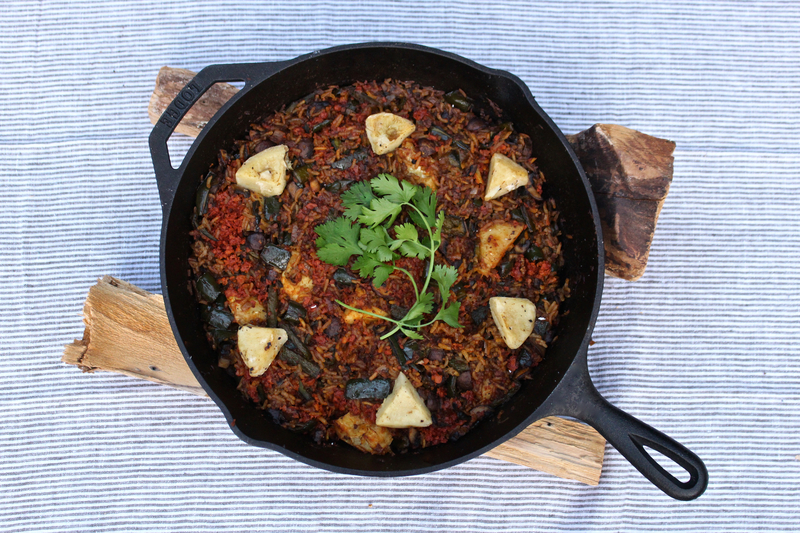 Credit where credit is due — this recipe is very much based on this Artichoke and Poblano Paella from Fresh Off The Grid. 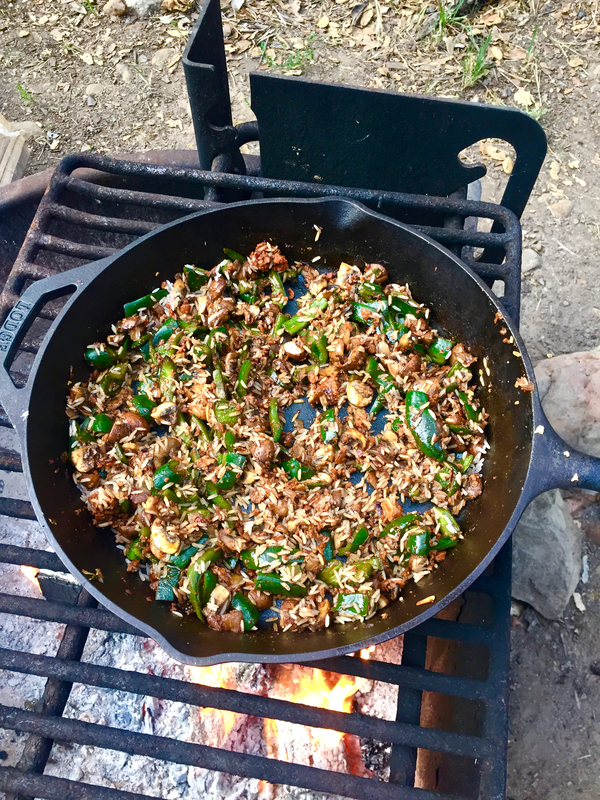 Place the cast iron skillet directly onto the grate over the campfire. Dice the onion. Add the tablespoon of olive oil to the pan, and begin to sauté the onion. 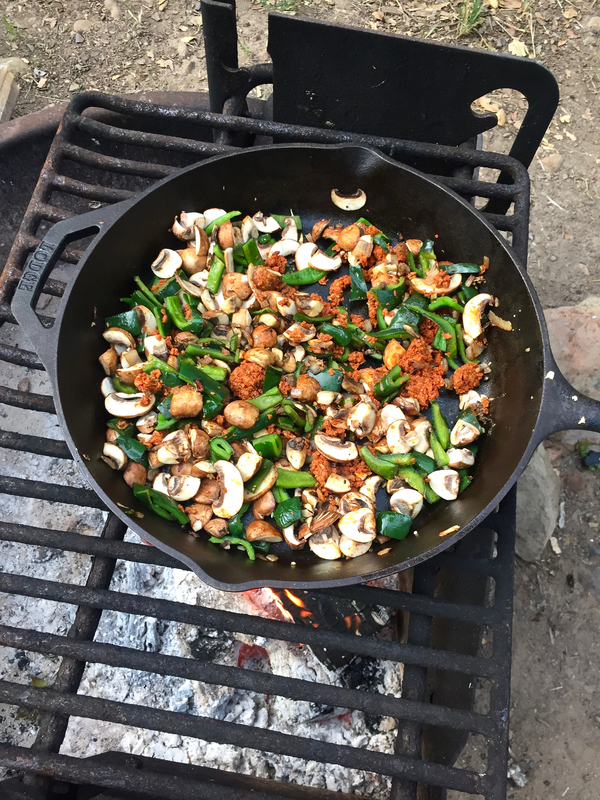 Dice the poblanos and cremini mushrooms, and peel and crush the garlic. Add the poblano, mushroom, and garlic to the pan, and sauté until the peppers soften. Stir in 1/2 the package of soyrizo. Add the dry rice and stir continuously for a few minutes. Once the tips of the rice begin to become translucent, add the wine. Stir and continue cooking until the wine has evaporated. Add the broth, saffron, and salt. Stir to combine all the ingredients, then allow the pan to cook undisturbed and uncovered, for 20-30 minutes. Once the liquid is almost entirely absorbed, stir in the artichoke hearts and the other half of the soyrizo. Make sure to do this while there’s still a bit of moisture in the mix. Once everything is evenly distributed, allow the pan to continue cooking. The crispy socarrat — the best part of paella — will develop over the next few minutes. Listen for the crackling of the rice. Once you can hear it crackling, cook for 2-3 more minutes, then remove from heat. Scrape scrape scrape and serve! The deliciously crusty bottom is best when it’s piping hot. Enjoy! Nice!! My camping meals are always oat cups and McDougall’s soup cups. Ha! This looks SUPER fancy! We haven’t camped in ages, but this would be fantastic the next time we do. Thanks for sharing the recipe!